It's always a treat to see Mogwai perform. The post-rock band have been ploughing their own furrow for almost two decades now and their fabulous soundtrack album for the French TV series Les Revenants/The Returned seems to be winning them new followers and appreciation. Listening to their albums you sometimes forget the impact that their live performances have, shifting from low key tranquil passages to crashing white noise that feels like getting punched in the chest. They've had a busy couple of weeks as they performed their soundtrack to Douglas Gordon and Philippe Parreno's film Zidane live in Manchester, London and Glasgow over the past fortnight. Alongside that frontman Stuart Braithwaite has been busy organising a gig and doing the round of newspaper interviews to raise publicity and funds for the campaign to save the Sighthill Stone Circle. Designed by Duncan Lunan, the astronomically aligned stone circle was erected in 1979 in an imaginative use of the government's Job Creation Scheme and was immediately criticised by Margaret Thatcher on her arrival in power. To this end it was never properly landscaped or completed and has always been a wee forgotten corner of Glasgow. Stuart Braithwaite (of Mogwai) is the son of John Braithwaite, technical supervisor to the project. Glasgow City Council recently announced plans to remove the circle as part of their application for the World Youth Games 2018, as part of a housing project. 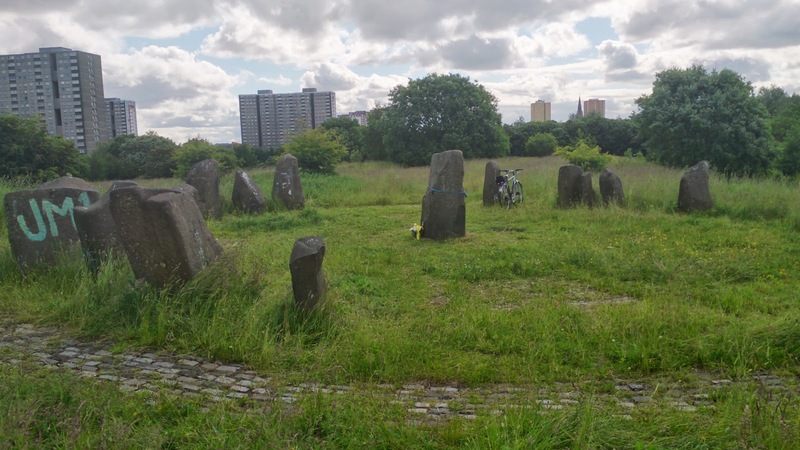 However as their application has failed, uncertainty surrounds the future plans for the area and there is growing support for investing in maintaining the green space around the circle properly and refurbishing Sighthill Park with the stone circle as its focus, completed to the original plans. But before seeing Stuart playing solo at the Sighthill Stone Circle gig we had the chance to see Mogwai perform last weekend in Glasgow. The venue at 220 Broomielaw caused a bit of head scratching but turning up on the night revealed that it was indeed the gap site down by the Clyde where the stage had been set up outdoors. Fortunately in a rare outbreak of summer they had picked a balmy evening and as the sun went down behind the neighbouring buildings Mogwai came onstage to perform the Zidane soundtrack live with the film projected behind them. I am a big fan of documentary films but this portrait of the footballer Zinedine Zidane plays out more like a drama with the rising music of Mogwai telling the story. It is quite hypnotic as we watch a Spanish league match but with the 17 cameras all focused on Zidane in real time. He broods, he frowns, he seems peripheral and in his own wee bubble whilst we read occasional subtitled thoughts from him on what goes through his head during a game, he paws the ground like a racehorse. As if someone scripted the whole thing, after initially going behind he lays on a fantastic pass for one of Real's two goals, emotionless throughout. When an unexpected smile breaks across his face it feels like high drama, then a minute later he needlessly punches someone and is sent off. It is quite hypnotic but I hadn't realised until seeing it live how much the music is the narrator of the drama. The final ear splitting crescendo left me waiting and waiting for Zidane's final, explosive act. The whole thing manages to convey the drama that is found in even the most mundane of football matches, and was made shortly before Zidane's crazy headbutt of Materazzi in the world cup final, showing that the film makers managed to capture something of the man. Six days later a fantastic line up of musicians performed at Easterhouse's Platform for the Sighthill Stone Circle cause. As my priority that Saturday afternoon was Partick Thistle's return to Firhill after the summer break (a nil-nil draw against AEL Limassol which didn't quite carry the same drama as Zidane's match) we missed Aidan Moffat's opening set and I think Duncan Lunan spoke about the circle too. However we were there to catch Graeme Ronald in RememberRemember guise, fighting against the noise from the bar with his looping tunes. After his first album I wondered how much mileage there was in this and then he came out with the fantastic "The Quickening" album, combining great music and a possible reference to one of my favourite films. So I await his next move with interest. 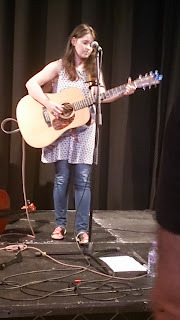 Next up was Eugene Kelly, once of The Vaselines doing his guitar and mouthie thing, before we were back across into the smaller hall for the exceptional Emma Pollock. (Is it just me that sees Shirley Henderson and Emma Pollock as twins seperated at birth?) 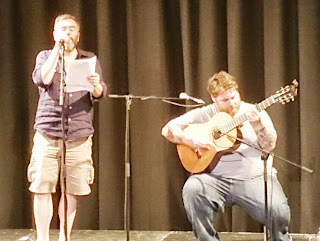 The one-time Delgado performed solo and then backed by 75% of the Cairn String Quartet. Her new material sounded good, particularly her song for Strathbungo, "Marchtown". 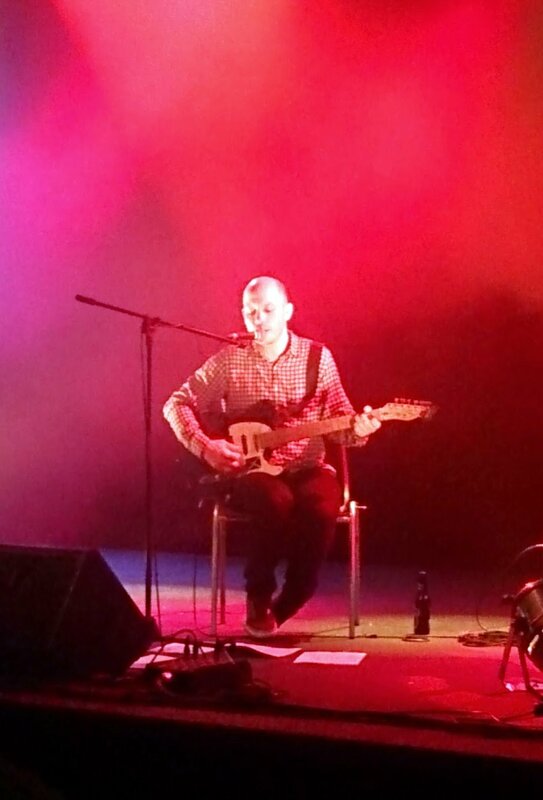 Then we had Stuart Braithwaite and it was great to hear some of the Mogwai material stripped down to just his singing and guitar, such as CODY. The highlights were from the more soulful, gospel end of the spectrum such as "What Are They Doing In Heaven Today?" which is a perfect fit on the "Les Revenants" soundtrack. Seeing him doing these songs in this way you can see the strange roots of Mogwai's music in these southern gospel and blues tunes. 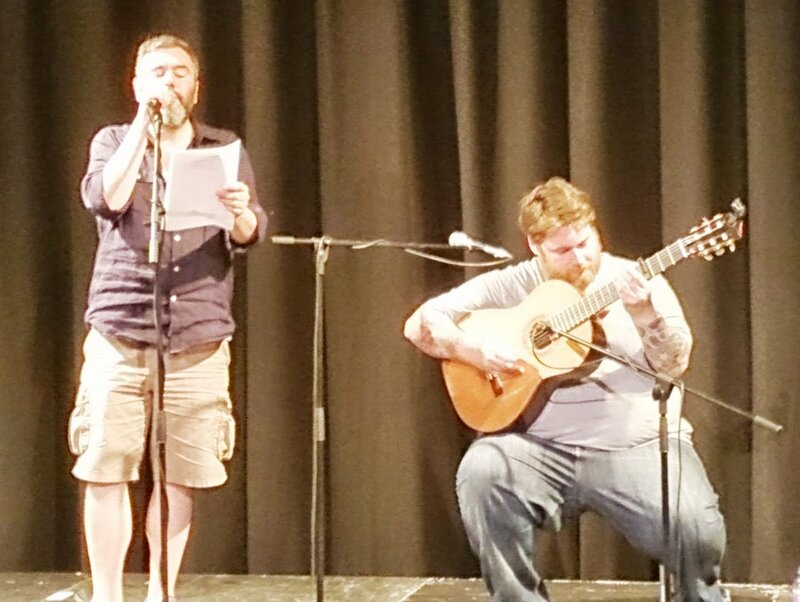 Next up was the winner of this year's Scottish Album of the Year award, RM Hubbert doing his thing on guitar but singing some of his new material too. He also reprised two tracks off of his last album accompanied first by Emma Pollock for Half Light and then in a finishing "battle of the bearded SAY award winners", by Aidan Moffat for Car Song. Kilsyth shoe-gazers The Twilight Sad brought proceedings to a close. As you can see it was a feast of fine tunes and I think they sold themselves short by charging only £6 for the tickets. 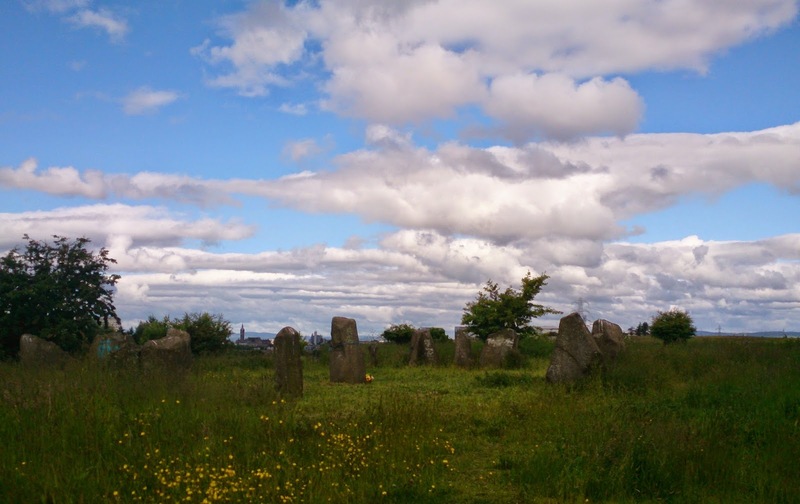 So if you are wanting to find out more about the Sighthill Stone Circle, sign the petition or get involved in the consultation, have a look at their website. Even better go and have a look at the circle itself and imagine what could be done to sort it out rather than demolishing it. If for no other reason than for the fact that it wound up Margaret Thatcher, take a minute to find out about it. Surely that is a good enough reason for preserving it?